Just how much can you teach someone in 180 seconds? Some of Fordham University’s brightest master’s and doctoral students showed that the possibilities are boundless at the Graduate School of Arts and Sciences’ second annual Three Minute Thesis competition March 13 at the McNally Amphitheatre on the Lincoln Center Campus. The Three Minute Thesis competition, founded at the University of Queensland in Australia in 2008 and now held at over 600 universities across more than 65 countries, gives participants just three minutes to explain their research to a non-specialist audience—and tell them why it matters. Seventeen GSAS students gave engaging and informative talks explaining their thesis or dissertation research, covering a diverse array of topics ranging from Latin American monetary policy to anxiety disorders in HIV-positive youth. The challenging exercise places students outside of their academic comfort zones, but the skills required to relate complex topics to a generalist audience are extremely useful, said Melissa Labonte, Ph.D., GSAS interim dean. Far from “watering down” their subject matter, several presenters said they found great value in the process of distilling their work to its essential elements. Rabasco’s research explores the underlying dynamics behind high suicide rates among transgender and gender non-binary, or TGNB, individuals—40 percent of whom attempt suicide at some point during their lifetime, as compared with roughly 4 percent of the general population. Her survey of TGNB individuals found that current victimization is the most salient risk factor for future suicide attempts, ranking higher than past victimization, body satisfaction, and even depression. tensions between secular education and traditional religious values, which drew on his experience as a sixth-grade English teacher in Cairo during the Egyptian Revolution. At the conclusion of the program, audience members voted for their favorite presentations. 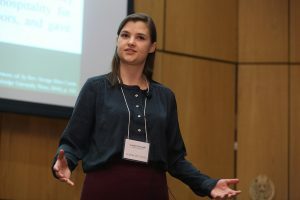 The “People’s Choice” prize went to Elle Barnes, a Ph.D. candidate in the Department of Biological Sciences, who explained her research on how urbanization is leading to changes in the bacteria present on the skin of New York City salamanders, impacting their vulnerability to disease. She hopes her work will also expand knowledge about how microbes in humans impact our own susceptibility to disease. “What can we learn from these tiny worlds? And can we use them to our advantage? These are the types of questions I’m answering with my dissertation,” she said.